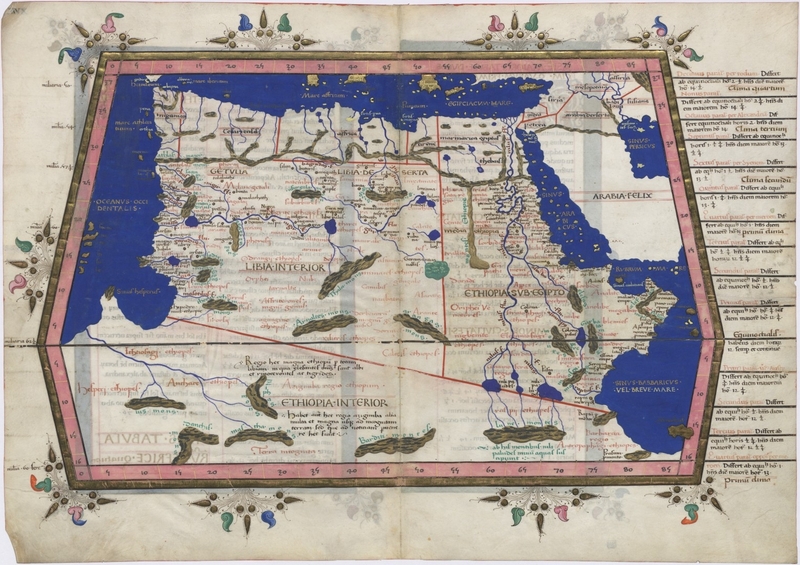 This map of north Africa by Jacob d’Angelo (author) and Nicolaus Germanus (artist) based on Ptolemy’s Geographia, was published in 1467 in Bavaria. The Mountains of the Moon are shown as Lunae Montes in the bottom right of the map, with rivers flowing north from the mountains to several large unnamed lakes. The success of ancient Egyptian civilization from as far back as 4000 BC came partly from its ability to adapt to the conditions of the Nile River Valley. The predictable flooding and controlled irrigation of the fertile valley produced surplus crops, which fueled social development and culture. The Greek historian Herodotus, who lived in the fifth century BC, wrote that ‘Egypt was the gift of the Nile’. The Nile in north-east Africa is 4,160 miles (6,695 km) long and is the longest river in the world. The Nile’s two major tributaries, the White Nile and the Blue Nile, meet near the Sudanese capital of Khartoum before flowing 1,857 miles (2,988 km) through the desert to the Nile delta on the Mediterranean Sea near Alexandria in Egypt. The longer White Nile rises in the Great Lakes region of central Africa, and its most distant source is considered to be the Ruvyironza (or Luvironza) River in Burundi. Finding the source of the Nile fascinated the Ancient World. Herodotus, Alexander the Great, and the Emperor Nero all puzzled how the river could flow through thousands of miles of desert without the support of a single tributary. Both the Greeks and the Romans tried to find the source of the Nile, but failed. In the 1st century, a merchant named Diogenes is said to have travelled inland from Rhapta in East Africa ‘for a twenty five days’ journey and arrived in the vicinity of two great lakes and the snowy range of mountains whence the Nile draws its twin sources’. He reported that the natives called the mountain range the Mountains of the Moon because of their snow-capped whiteness. These reports were accepted as true by Ptolemy, the 2nd century Greco-Roman mathematician and geographer living in Alexandria. Ptolemy wrote a cartographic treatise, Geographia, on what was known about the world’s geography in the Roman Empire at the time. Only copies of the original maps in the atlases in Ptolemy’s Geographia survived, so early Renaissance cartographers produced maps from these copies based on the coordinates in the original text. In the maps of north Africa, the source of the Nile, as depicted by Ptolemy, are rivers at the foot of the Lunae Montes, or Mountains of the Moon, which flow into two large unnamed lakes. 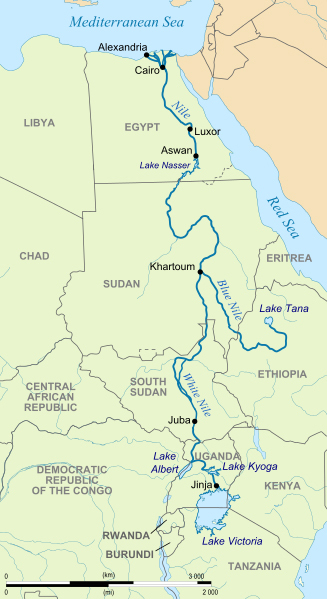 Map of the River Nile showing the source of the White Nile at Lake Victoria and the Blue Nile at Lake Tana in Ethiopia. The Mountains of the Moon lie south of Lake Albert along the border of Uganda and the Democratic Republic of the Congo. It would be another 1,700 years before an expedition commissioned by the Royal Geographical Society set out from Zanzibar in 1857 to ‘find’ the source of the Nile. It was led by the British explorer Richard Francis Burton with John Hanning Speke as his junior. Burton was an army captain and intelligence officer in India; blunt, bold, enigmatic and resourceful (though he was to be seen later as a slightly disreputable intellectual). Speke had also been in the army in India as a lieutenant. He was said to be upstanding, charming, and fanatical about fitness, and he had been a surveyor and a naturalist. Speke had already been on an expedition with Burton to Somalia in 1854, and although their qualities appeared complimentary, they had not got on well. Their personalities turned out to be totally incompatible, and a poisonous rivalry developed between them. In February 1858, the explorers, each suffering ill-health from a variety of causes, reached the southern shore of Lake Tanganyika (known to the Arabs as the Sea of Ujiji), which Burton was convinced was the headwater of the Nile. After three months, they started back towards the coast but they heard of a large lake to the north. By now Speke had recovered and he set off with a small party, but without Burton, to find the lake. After 200 miles, he reached the southern shore of Lake Victoria (known locally as the Sea of Ukerewe) in August 1858. After calculating the height of the lake above sea level, he concluded intuitively that this lake, and not Burton’s, must be the source. He then hurried back to Burton to announce his great discovery. Burton demanded what proof Speke had that it was ‘the’ lake. Speke suggested that they should both go and investigate the lake’s true extent, but Burton rejected this. This was a tactical blunder by Burton. Speke began to see the ‘discovery’ as his own, and perhaps Burton’s scepticism reflected his fear that he had made a fatal mistake.